EUR/CHF rejected at session highs at 1.1357, trades unchanged at 1.1346 at 0715 GMT. The single currency edged higher as markets turned to risk-on after the British members of parliament voted for delaying the Brexit deadline from March 29. Further supporting sentiment were comments from the US President Donald Trump that signals US-China trade solution in next 3-4 weeks. Focus now on final reading of February Eurozone consumer price index (CPI). 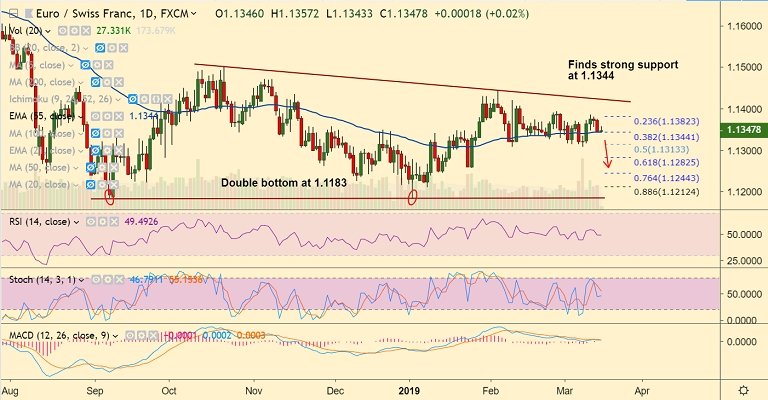 Miss on expectations could dent the euro. Eurozone CPI is expected to remain unchanged at 1.5% y/y while likely confirming 1.0% Core CPI. However, the monthly figure of CPI might increase from -1.0% flash version to +0.3%.